A procedure is a set of instructions written to guide the execution of a process for either personal or business benefits. The step-by-step lead to executing an action often helps an enterprise or an individual to handle simple-complex projects in the shortest time possible. Of course, without a clear set of instructions, execution of tasks will be impossible, and that is why you need the best procedure template. 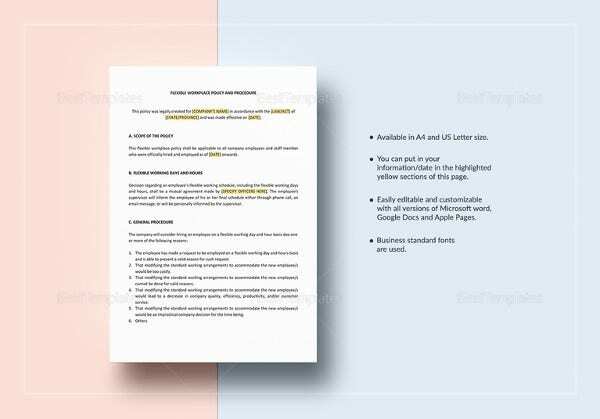 The Standard Operating Procedure templates are best for writing professional and reasonable methods and approaches for solving a problem in hand. 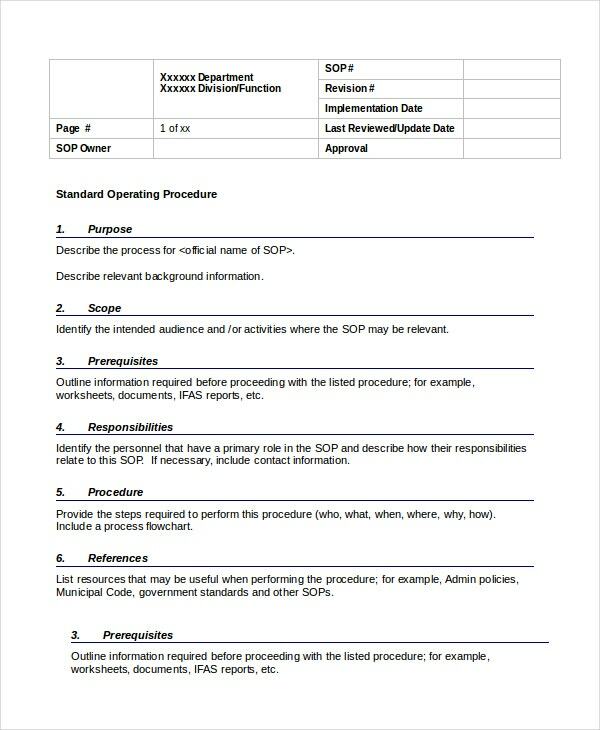 The standard operating procedure is a set of rules that determine the execution of an operation. 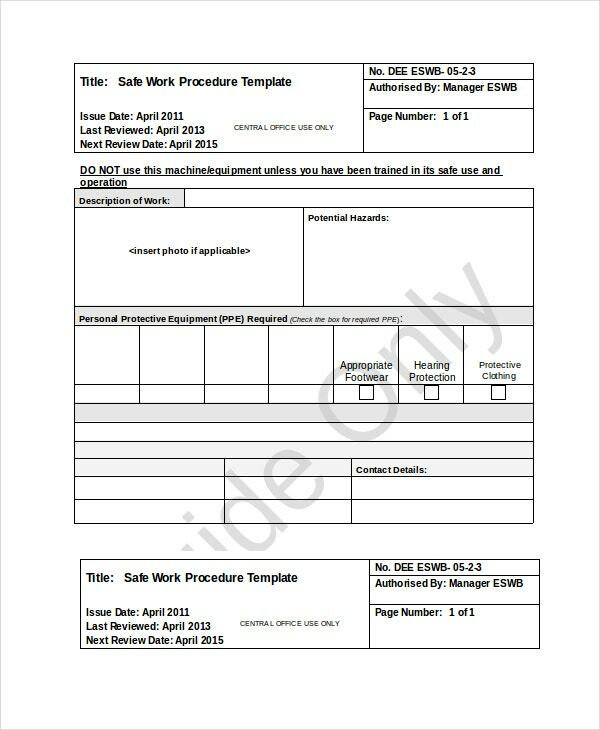 The procedure template is comprehensive, easy to customize, and easy to edit. The standards of your company are fully dependent on the policies and procedures. If you compromise any of these guidelines, your business will be more than likely dead. This template is a clear example of the best internal policy and procedure. > Who should Use the Procedure Template? Almost every person needs a procedure template. 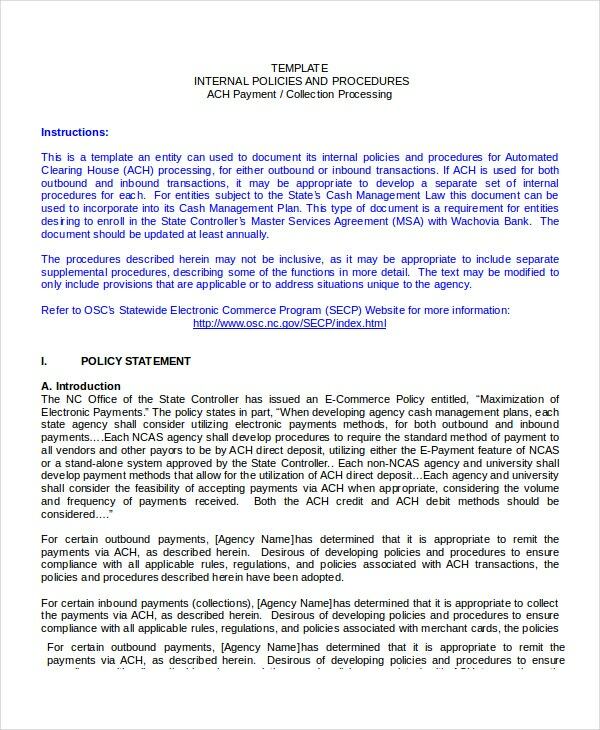 The document contains the step-by-step instructions for fulfilling a policy, executing a process, or filling out a claim, to mention only a few examples. People who use these templates, often want to achieve something or meet a goal, at the end of the day. 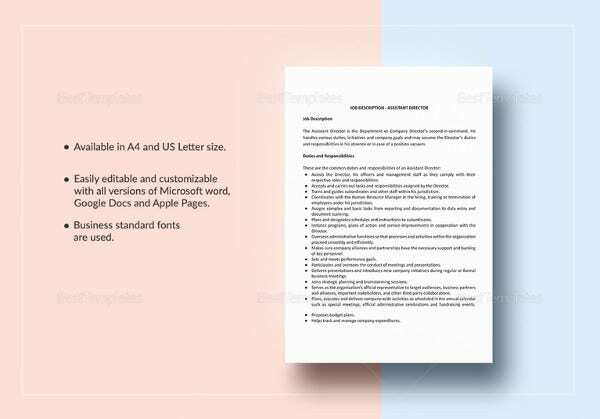 The word manual templates have become the most significant tools for the day-to-day activities of various kinds, and people often find them quite useful for those projects they are busy working on. The idea is that by following a set of procedure to do a work, one has the guarantee of the best results possible. If you want to run a successful business, you should have the right system for managing payrolls and payments of your employees. 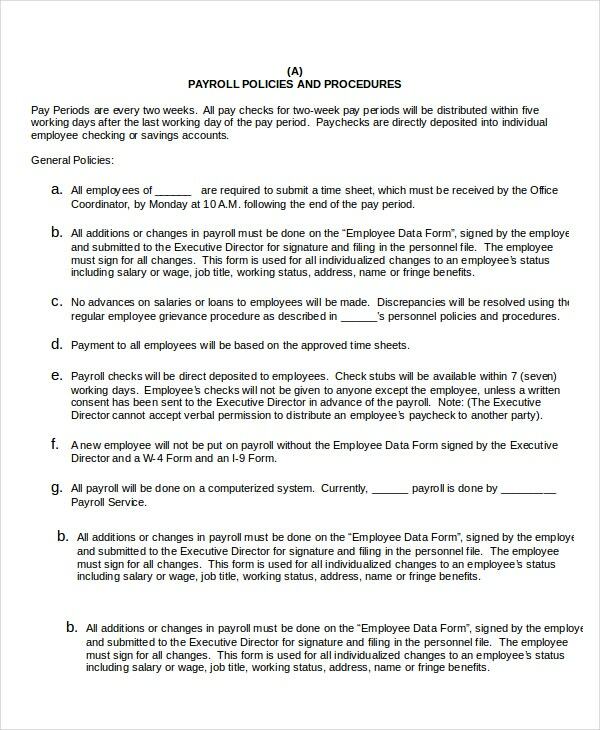 This template can give you a clear overview of how a good payroll policy and procedure looks like. 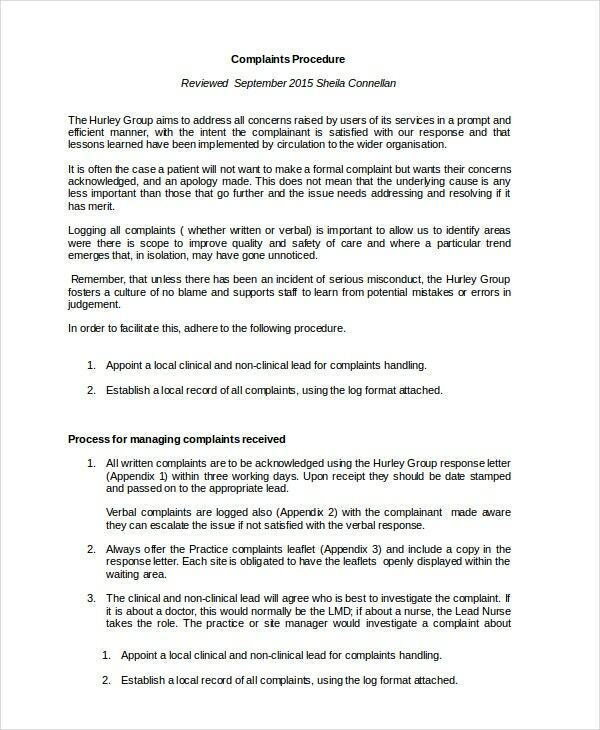 This document outlines a systematic guideline that people can follow to present their grievances. 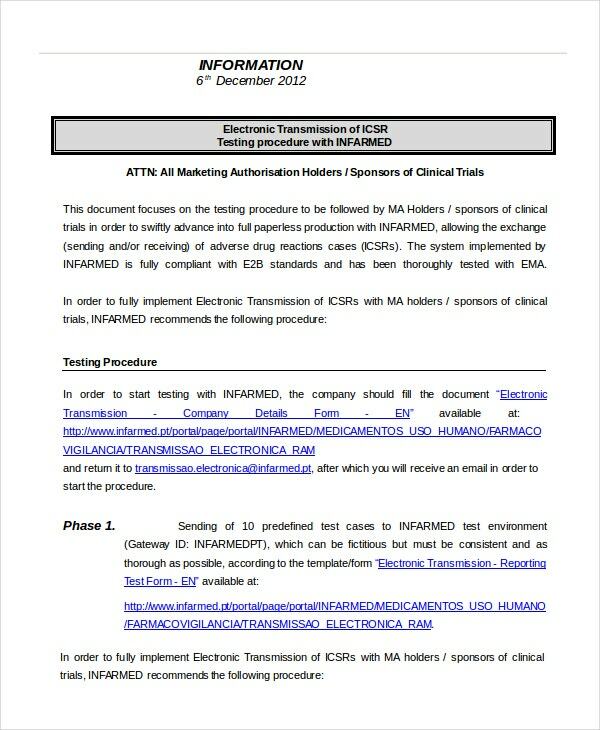 The users of the document include customers, employees in a company, service providers, teachers, parents, and more. > What are the Uses of Procedure Templates? Procedure templates have a couple of uses. In determining where to use this document accurately, you need to understand that how a process works highly depends on the environment in which a user implements the methods. For example, a software developer will use the test procedure template to test, debug, and implement a software solution. A teacher, on the other hand, will use the procedure template to help students understand how a chemical concept in Chemistry or Physics works. Another good example is the loan borrowing process. It has policies and procedures that are entirely different from those of software testing. It all comes down to the fact that how you use the template depends on your environment. Software developers must have proper test procedures to determine the efficacy of a new system. By using test methods, developers can identify the effectiveness of a software solution as well as identify and fix bugs. > What are the Benefits of Procedure Templates? These procedure templates will help you do the right thing at the right time for the benefit of your project. When you have a set of instruction templates written down and distributed to your team members or the target audience, you eliminate the need for guesswork, unreasonable time wastage, and poor results. What’s important to understand is that a procedure helps you to maintain a consistent flow of activities so that you don’t have to struggle to know what to do next. Maintaining a comprehensive procedure list will help you and your other users to have the assurance that they will be doing the right thing when they follow these procedures. It is not possible to complete a process without a procedure. Even small projects with definite timelines often demand a comprehensive systematic guide to complete the project successfully. Business operations need systems too, to remain as professional as possible. Therefore, if you have never created procedures for your business before, this will be the best time to do so.